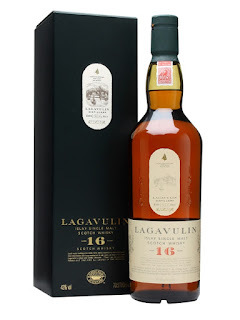 Quite a famous one to review today, it's the Lagavulin 16yo. I'll be the first to say this isn't my favourite malt. I like Lagavulin but I always found the 16 quite flat. But I'd never had it from a proper glass. Well, how can you judge something you've never even tried properly?! True. So I did. And I found it a lot better. I think it is also the batch, because I found the new one very different. I've included both sets of notes. Nose: Lots of classic Islay peat smoke with chocolatey malt, some hay and grass, wood smoke, woody spice, burnt oak, soft fruit- Apple and lemon. Taste: Soft and light. Malty chocolate, smoky barley sugar, soft peat smoke, quite fruity- Apple with developing citrus- Lemon. Then more smoke develops with burnt oak, burning hay and grass, bonfire. Finish: Short length. Smoky notes fade very quickly leaving a hint of salt. Nose: Medium. Fruit and smoke. Some lemon and lime citrus. Taste: Very smoky and sooty, ash, Lapsang tea, some fruit, then more citrus. Oily and full. Not sure how I found the other batch light, this is pretty full on. Finish: Long length. Citrus, lime, peat. Same Mark as the new 8yo, Lg5 and Cask Islay. I'll admit it's a good whisky. But for £50 I'd prefer an Ardbeg. Although, I'm always very tempted by the price in France, which I've seen at £35.